Resin Bear Teacher Ornament with apple; 3.25" resin teacher ornament who is sitting on a book that says teacher with a pencil on it. The bear is also holding an apple. 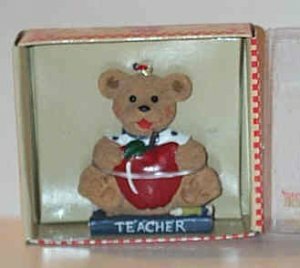 We can personalize with the t..
Resin Bear Teacher Ornament with apple; 3.25" resin teacher ornament who is sitting on a book that says teacher with a pencil on it. The bear is also holding an apple. We can personalize with the teachers name on the apple. Makes a great gift for that special teacher for any occasion. Can sit on teachers desk or they can hang on the wall. Please specify if need to be personalized when ordering. Buy a couple and keep them handy when need a quick gift.